Looking up from ground level. Hiding in plain sight around the downtown area and a few neighborhoods, these 165-foot industrial artifacts could (collectively) be considered an outdoor museum. They are (collectively) listed on the National Register of Historic Places. 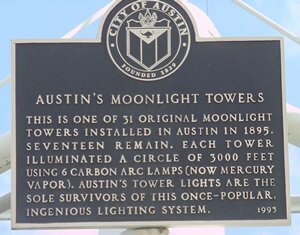 Today, in the entire United States, only Austin has surviving examples of this type of lighting system that was once popular in many U.S. cities during the late 1800s. Seventeen (of the original thirty-one) towers are scattered around "old" Austin - with the greatest concentration being around the Capitol. Surprisingly, only a few have been lost to automobile mishaps. A complete list of locations (as of 1985) can be found in T. Lindsay Baker's Building the Lone Star. 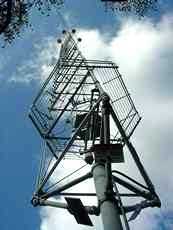 The actual Lights -atop the tower. Intricate hardware - the wheel was part of a hand-operated elevator that brought workmen to the top. 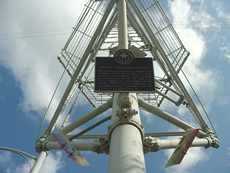 The towers are actually 150 feet tall with a fifteen-foot foundation. They were shipped from the manufacturer in Indiana and assembled on site. 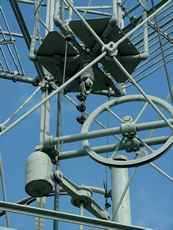 When first installed, the towers were connected to their own electric generators at the Colorado River dam. The area lighted was a 1,500 foot radius and it was meant to provide enough light to read a watch by. Over the years they were switched from their original carbon-arc lamps to incandescent lamps in the 20s to mercury-vapor lamps in the 1930s. When they were carbon-arc, the light was brighter, however, nightly inspections were required. 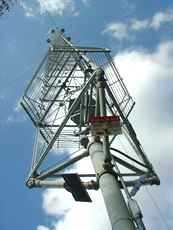 Mercury-vapor lighting allowed the installation of a simple switch at the towers base. Wartime considerations required a central switch in case a blackout was necessary. One of the recently attached plaques. 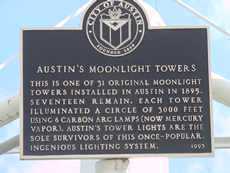 The Moonlight Towers were officially recognized as state archeological landmarks in 1970 and six years later they were listed on the National Register of Historic Places. 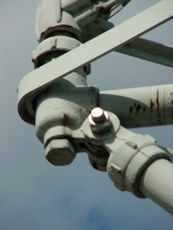 In 1993 the city of Austin dismantled the towers and restored them down to every bolt, turnbuckle and guy wire. Our visit in 2004 showed the restoration to holding up well. The work appears as though it was completed last week. The warning. Shortly after installation - there was a suicide. 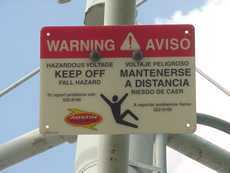 The only recent addition to the towers, besides the historical plaques, has been the signage warning people not to climb them. 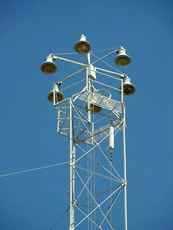 Texas Escapes, in its purpose to preserve historic, endangered and vanishing Texas, asks that anyone wishing to share information, stories or vintage photos of the Moonlight Towers, or local history and vintage/historic photos of their town, please contact us.